Logan Vocalist is based on a rare 1970s Synthesiser. It can create the beautiful analogue choir sounds from the '70s, vocal effects and lots of ethereal choir pads and other sounds. 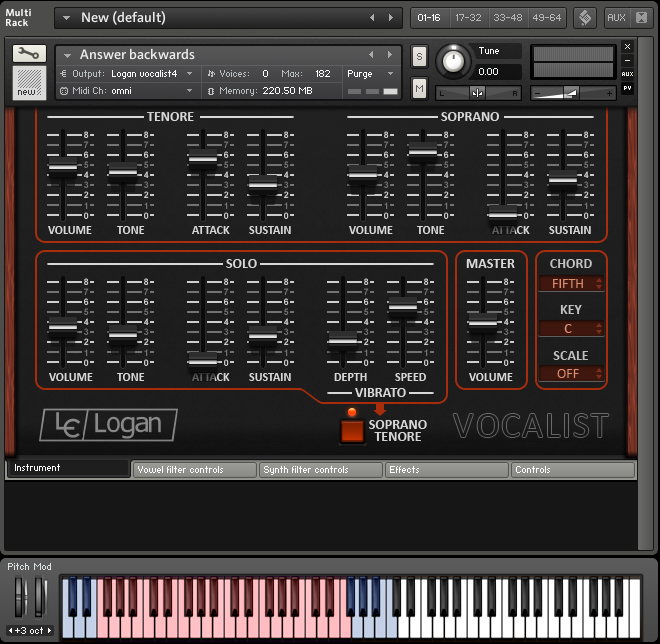 Intuitive user interface based on a real Logan Vocalist front panel. Extra filters, LFOs, filter envelopes and a full effects section have been added. Chord generator allows for big chords to be played by pressing one key. Each section of the Logan has been sampled chromatically using high quality converters for a true authentic sound. Full version of Kontakt 5.2.1 or higher is required.